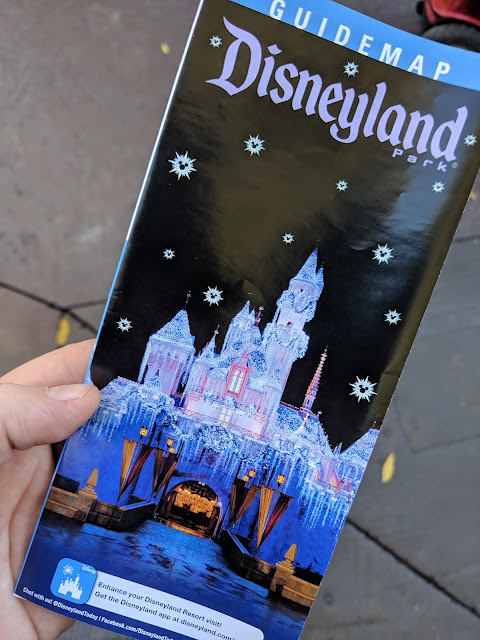 Putting this photo here in the ole' online diary to note the inclusion of this seasonal Parks Map. I've posted other Disney Parks maps/guides including both Tokyo Disneyland and Tokyo Disney Sea here. And a guide for Mickey's Not So Scary Halloween Party from 2017 here. Over the past ten days or so, I've posted some items from our recent trip to DLR but really didn't mention the trip. We've been to Disneyland Resort and Disneyland Park a few times over the years, but this trip was just a little interlude before a larger Disney-centric vacation. We stayed for a few nights and spent a good chunk of the days at the Parks in Anaheim. Would we do things differently? I think so, but we decided to try something new and NOT take my own advice. What was that advice? If you get a chance, stay at the Disneyland Hotel at the Disneyland Resort. They really drape themselves in Walt and the place is themed to Disney itself. Not far-away polynesia or 1920's New Jersey Shore. But Disney. Walt and Mickey. Mickey and Walt. ...Do yourself a favor and if you are heading to Anaheim for a visit to the park, try your best to stay at the Disneyland Hotel. It is worth the few extra bucks. We decided to try a "Good Neighbor" hotel and I'm not sure if that was exactly it, but we didn't love things. I loved the parks, but because we didn't love our hotel, I think we did what a lot of Disneyland visitors do: we went hard at the parks and didn't take many mid-day breaks. We didn't view our hotel (or motel, frankly) as a 'break' from the parks like we do when we stay on-property. The hotel we stayed at had a great location - better than the Disneyland Hotel frankly - but turns out that location is just one element of a great DLR stay. There's much more than location in making it feel special and like a vacation. Maybe that's a little bit of Disney-snobbery coming out? I don't know. But, there's something to be said about staying at the Disneyland Resort that is different than the "Good Neighbor" motels. Sure, you pay more. For us, the price was double. But, looking back, it seems that the money would have been well spent. That's easy to say in hindsight, but next time we go, we're staying at the Disneyland Hotel.